Love was definitely in the air today when Heart Research UK visited Caravan Guard! 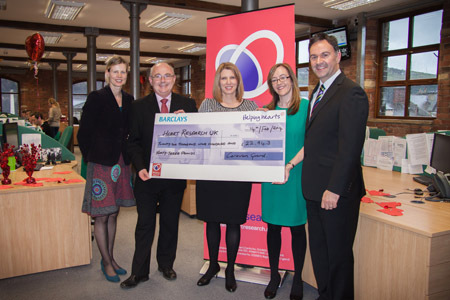 Representatives from the national charity called into our offices to collect the latest Paperless Policies donation. The Paperless Policy initiative sees us donate £1 every time a customer chooses to have their insurance documents sent by email. Set up in 2009, the initiative has exceeded exception year-on-year and has now raised a huge £22,943 for the Leeds-based charity. (L-R) Heart Research UK Lifestyle Officer, Katharine Greathead and Income Development Manager, Brian Curran accept the cheque from Caravan Guard Director Sally Wilby, Contact Centre Team Manager Ruth Boyle and Head of Development Neil Menzies. After surpassing 2013’s target, we’re hopeful that the best of Paperless Policies is yet to come!